I have just been invited to sing at the re-dedication of Saint Andrew Presbyterian Church, re-opening after many months of construction. Longtime readers may recall my frustration with this church – I am not a member, but my choir rehearses there, and will again once they are open for business. I have not had the opportunity to see the renovation yet, but the choir director assures me that Things are Accessible. 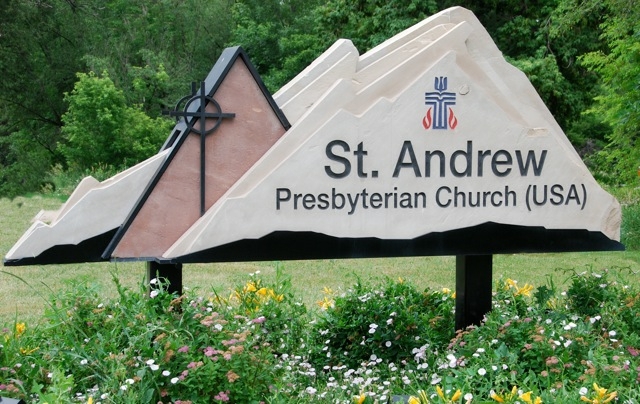 Improvements… St. Andrew is meeting the needs of the congregation and community with many improvements to the facilities and enhancements to its ministries. There has already been improved handicapped accessibility, seating in the sanctuary, signage, lighting and more. Construction is now underway, including major improvements to our sanctuary and Parish Hall, a new Atrium, a brand new kitchen, improved storage, and other enhancements such as an elevator which will make the entire building handicapped accessible. So, we’ll see. The re-dedication is November 19th. I’m going to do my best to remember my manners. I hope it’s true. “We’re working on it” seems to be the standard Presbyterian response to a lot of church access problems. I know of one Presby church that’s had at least seven years of singing “we’re working on it,” and still has no real accessible parking or bathrooms…sigh. They’re working on it. Uh-huh. Thanks for “taking the arrows” and being out front. Otherwise these changes may not get done. I have recently been reminded never to take someone else’s word on accessibility. I have fought for years with my uni to get various buildings and areas more up to code. Recently, several new buildings have been constructed in which the developers promised that “things would be accessible”and yet they aren’t. Not a single lab space has been adapted. Because I am no longer a science student, I can’t even claim that they haven’t met the duty to accomodate! Perhaps bebefore it costs them lots more money and you plenty more aggravation, maybe you could ask for a tour of the new facilities before they are finished. Say you are willing to be their “access consultant” free of charge. Thank you all for your comments – I hesitated to even post about it before seeing it myself, and I am still sceptical. It’s way too late to offer any input, and I’ve been there, done that, with these people. I found an accessibility consultant for them and we toured the building together with the minister. After several rounds of commitment on their part (including getting funds allocated) with no follow up, I’m not very interested in being part of that process. We’ll just have to see how they’ve managed to do – I’m not the only crip in town, and it’s not like making buildings accessible is rocket science. It is a sorry measure of my cynical eyes that at first I read — truly, I did — , The re-education is November 19th. Let’s hope they don’t need it. yeah, I hear you on the burnout – after awhile you just get tired of telling people the same things over and over again. Church people are funny – access isn’t rocket science, but sometimes committing the funds is. It seems like there’s always something that needs the money more. Interestingly, when I was in Ireland in 01/02, there was a new UK legislation coming in to play that even charities (“trusts”) and other agencies had to obey to the utmost they were able to by 2004, I believe. I stayed in a student hostel that had adapted a 200 year old farmhouse with wheelchair accessible washrooms and a ramp the likes of which I will likely never see again! It was also a church organization and they took the view that, since it was happening anyway, and I wanted to come and work with them, they were going to do it as much as they could, and all in one go! They had a tremendous attitude and far fewer resources than my own church at home does (and interestingly hasn’t adapted itself yet either). It just comes down to a personal willingness to commit to someone else’s need. okay so here I am commenting again, but I just wanted to say that I read your “wheelchairs” page and I was really surprised that your doc and your physio both said that “those chairs are for athletes, not middle aged moms with MS.” Thing that they never tell you is that rigid frame chairs are lighter by far and in many cases (probably yours because you’re small – yes, I looked at your home reno page) the rigid chair fits in the same cubic space that the folder does. If you think a revolution rides like a sports car, wait till you try a rigid frame titanium chair. Anyway – I fully understand that choosing wheelchairs is very individual but i hate it when people get bad advice! Jocelyn, I need to update the wheelchairs page (and the renovations page, and the travel page, arghh!). I’m currently in a Top End Terminator Titanium, and you’re right, the Rev is a clunker compared to this chair. Maybe it’s our side of the border, but I am not seeing any great rush to put people in lightweight chairs, more’s the pity.